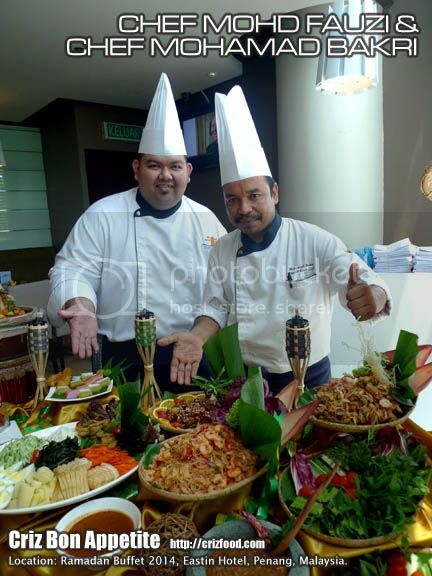 Swez Brasserie @ Eastin Hotel, Penang, would be having its “Eastin Ku Kampung Ku” Ramadan Buffet Dinner from 18 June until 18 July 2015 (7.00pm-10.00pm). 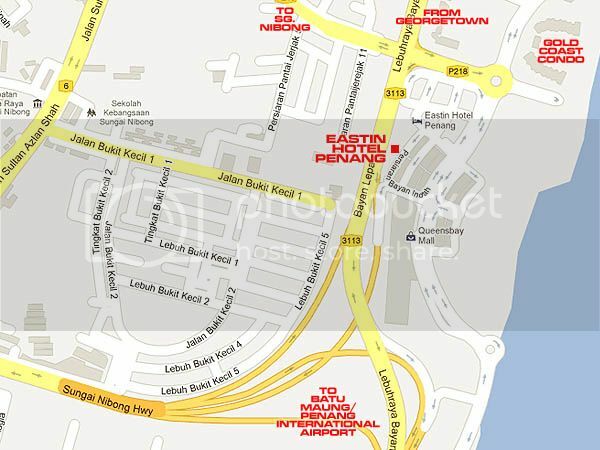 The price would be at RM104nett/pax (Adult/Senior Citizens 60 years old and above will get 50% off) and RM52nett/pax (Child). 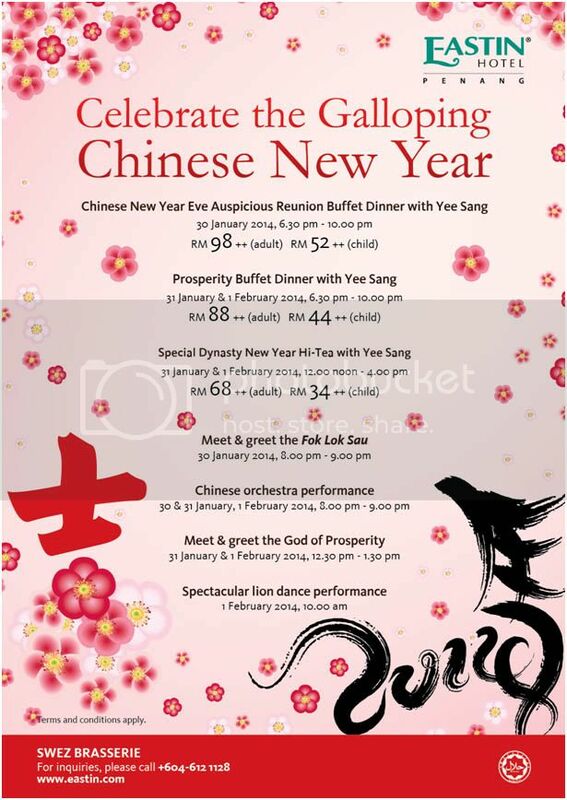 If you are thinking of purchasing for 20 pax and above, there are some great voucher offers at good bargain prices stated below. 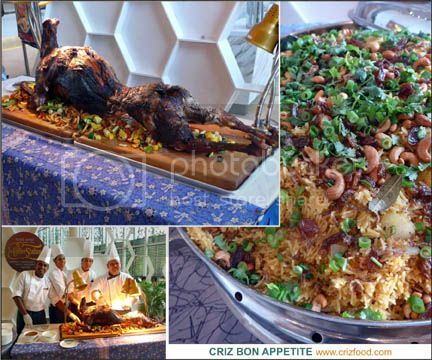 The Ramadan Buffet Dinner would consist of traditionally prepared authentic and favorite kampung style Malay cuisine, under the experienced hands of the hotel’s Malay Kitchen. 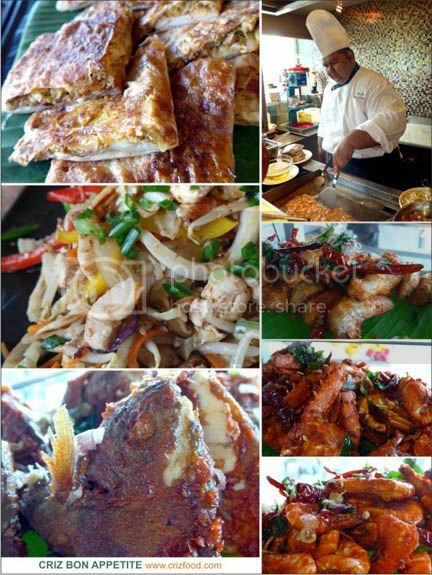 Here are some of the sections you might find interesting during the “Eastin Ku Kampung Ku” Ramadan Buffet Dinner. 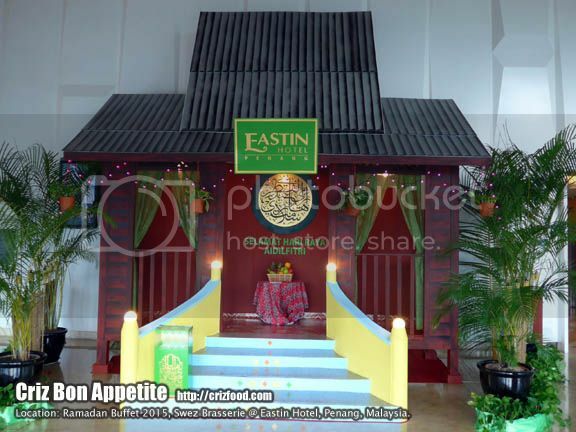 What are the “MUST TRY DISHES” at Eastin Hotel Penang during this coming Ramadan? 1. 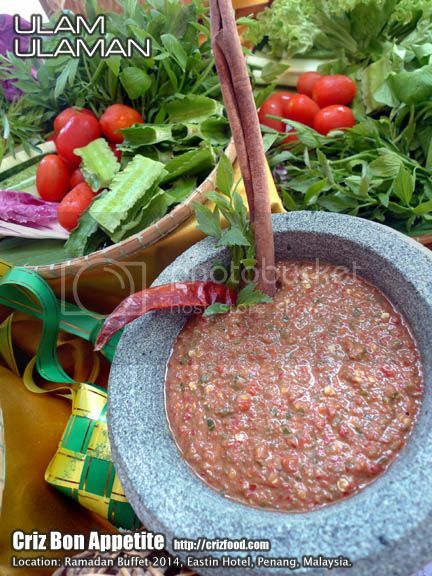 There are many different types of sambal such as the sambal cincaluk, sambal mempelam and sambal kelapa to go with your dishes. 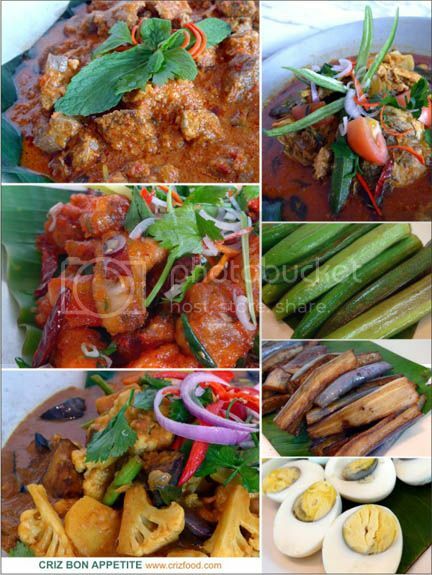 Various kinds of sambal are must in most Malaysian cuisine and only during Ramadan do they produce certain varieties. 2. 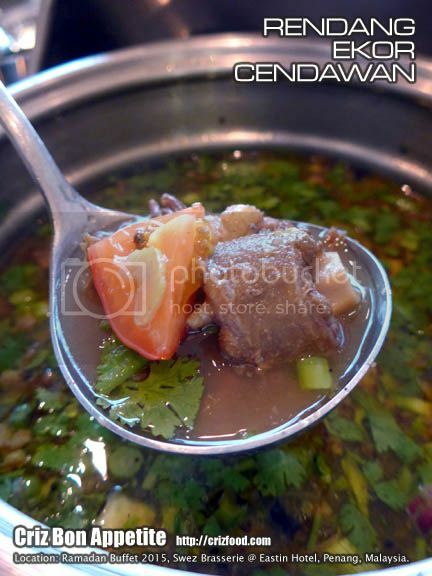 You should try out the Malaysian version of Oxtail Soup with added mushrooms known as Sup Ekor Cendawan. 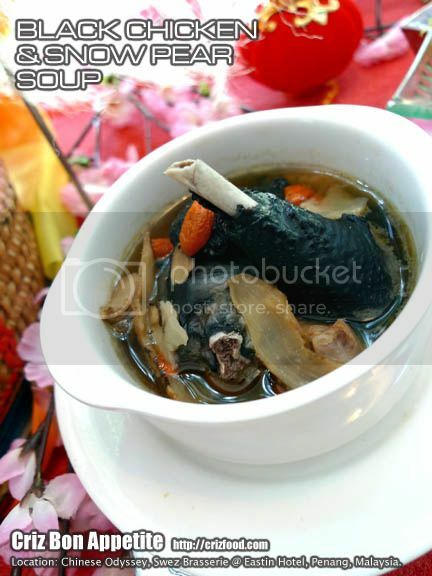 It’s an impactful yet flavorful soup with the uses of local herbs and spices plus beef bones stock. 3. 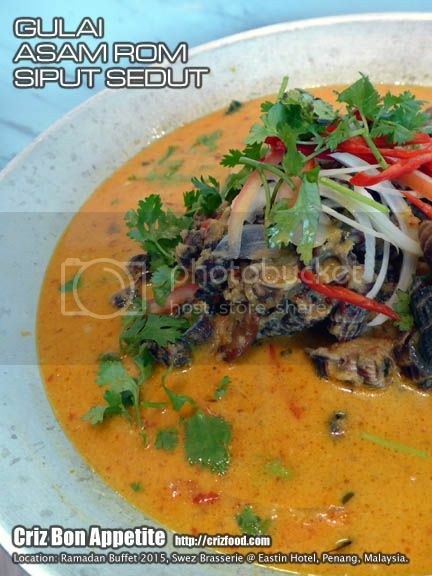 Another dish to take note will be the Gulai Asam Rom (Asam Rong/Aserong/Asrong) Sayuran/Siput Sedut, an appetite booster. 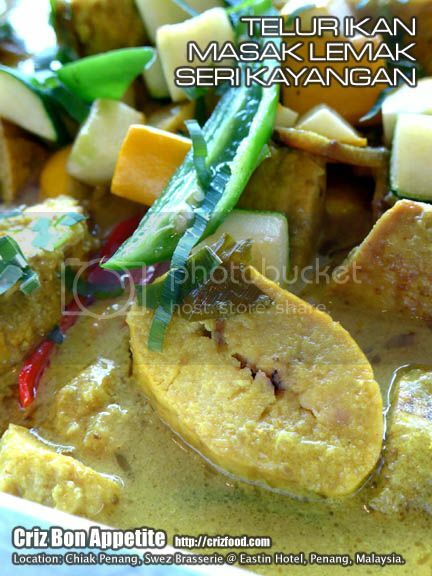 This famous Pahang dish is quite rare in modern days as the main ingredient of buah perah (kelampai/rampeh/Elateriospermum tapos) is rather hard to obtain due to our fast development, except maybe from the jungle of Pahang, Sabah, Sarawak, Indonesia or Thailand. 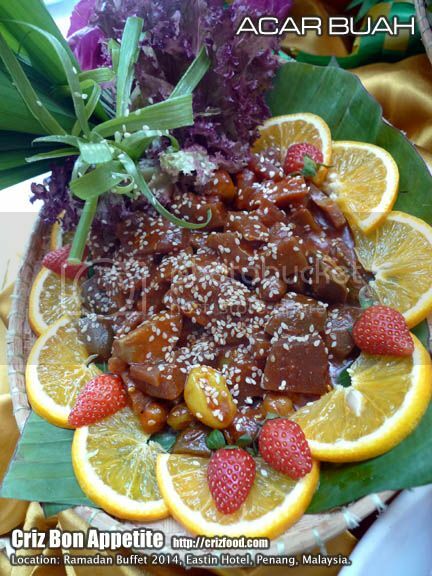 As it tastes just like the rubber tree seeds, some might use the rubber tree seeds instead. The curry has unique flavors and can be quite addictive. 4. 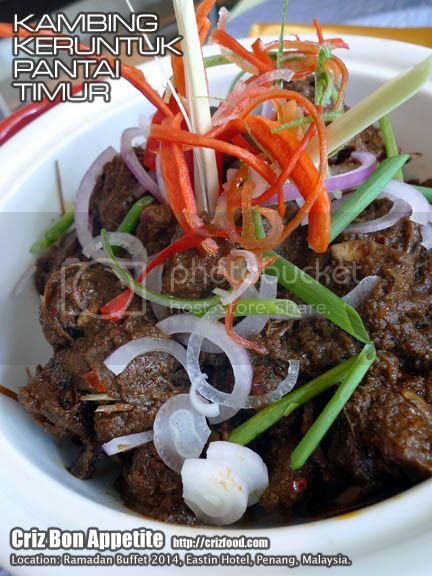 You might have heard about Oxtail Soup but hardly would you get Oxtail Rendang aka Rendang Ekor from your usual Malay restaurants. 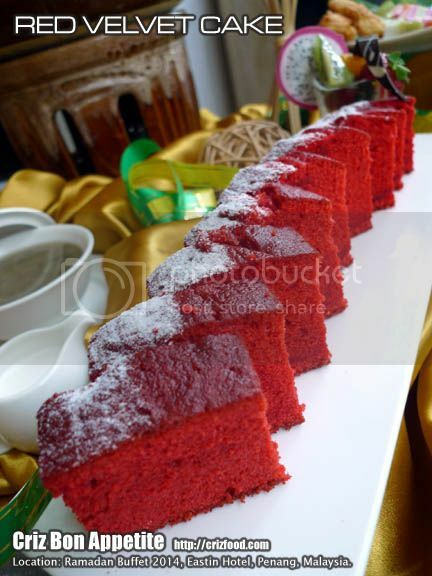 This is the secret recipe of the chef’s mother. 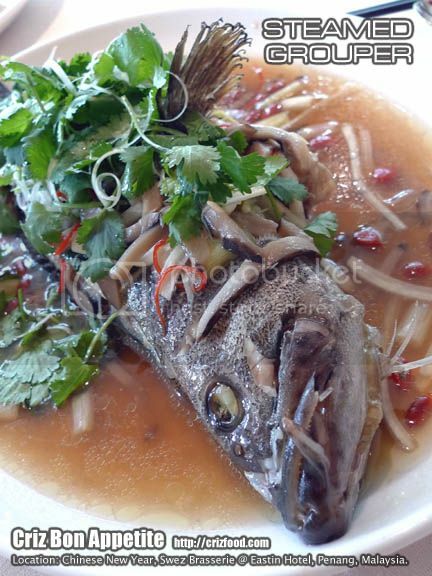 It’s best not to miss out the chance to savor this unique dish. 5. 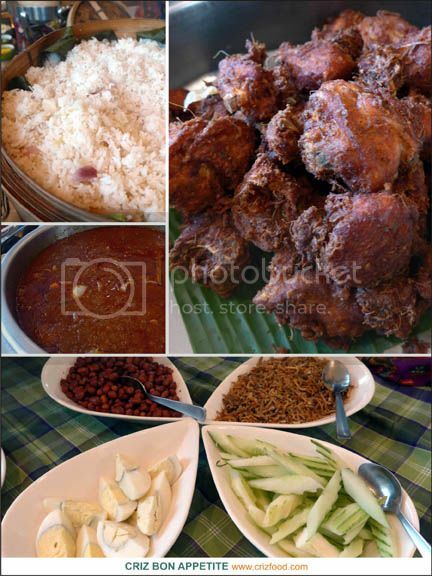 Do check out the Nasi Lemak Kukus Action Counter for Malaysian’s favorite dish. 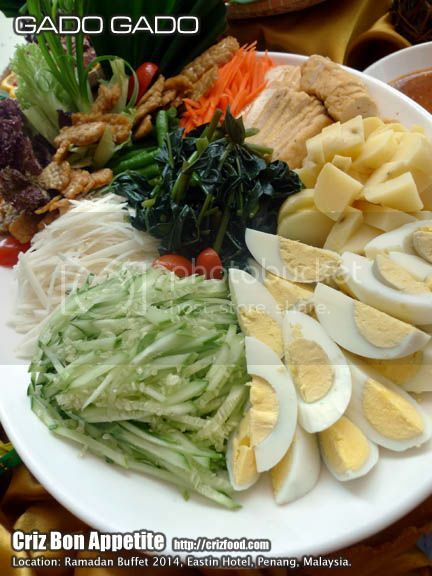 It may look simple but once you have a mouthful of the fragrant coconut milk infused rice accompanied with the flavorful sambal tumis, hardboiled egg, ikan bilis, fried peanuts and ayam goreng berempah, you would want to seek for more. 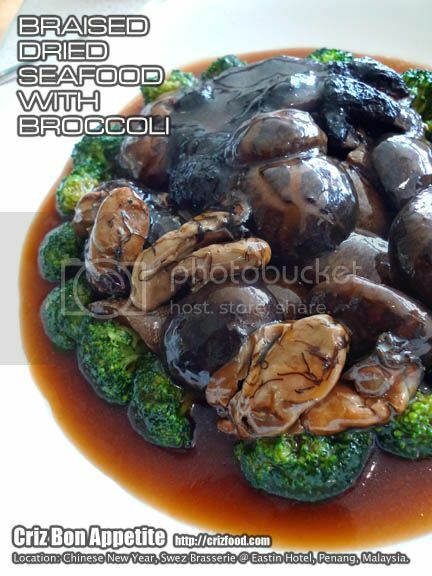 It’s truly an addictive dish for all. 6. 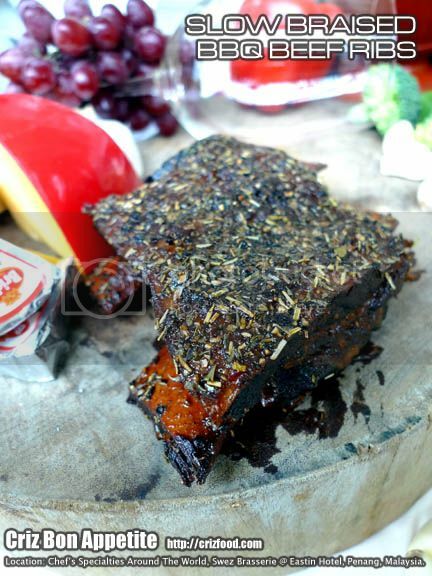 You would hardly see a Whole Roasted Lamb unless it’s for grand occasions. 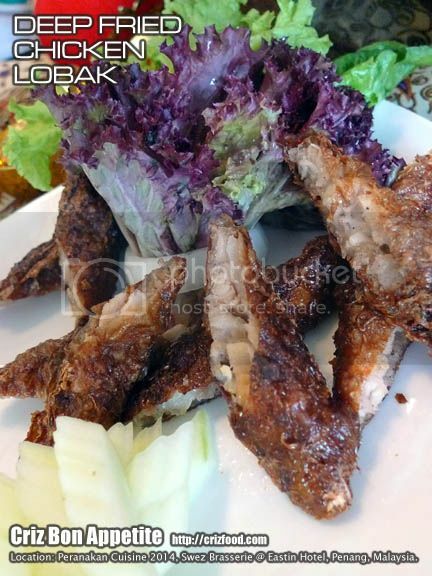 The tender yet juicy meat had been marinated with special herbs and spices for 3 days prior to being roasted until perfection. 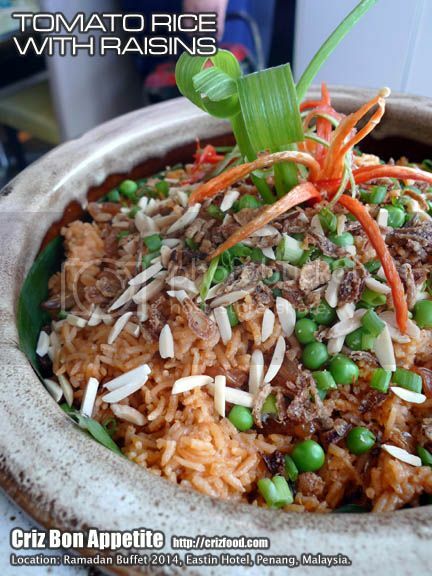 This will be served with Middle East style of Bukhari Rice, using basmati rice cooked with tomato paste and various spices. One word~ Lazeez! 8. 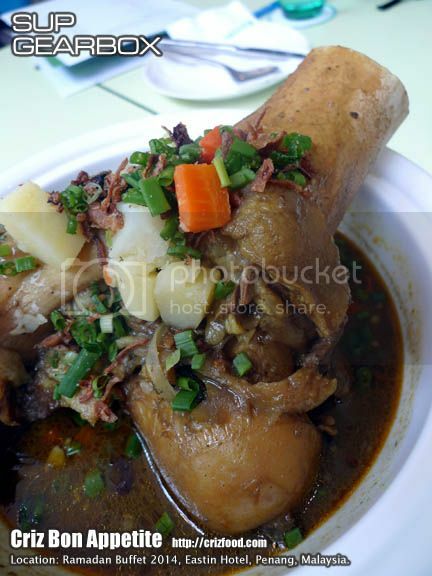 For more energy and stamina during the puasa month, you should try out their signature Sup Gearbox. 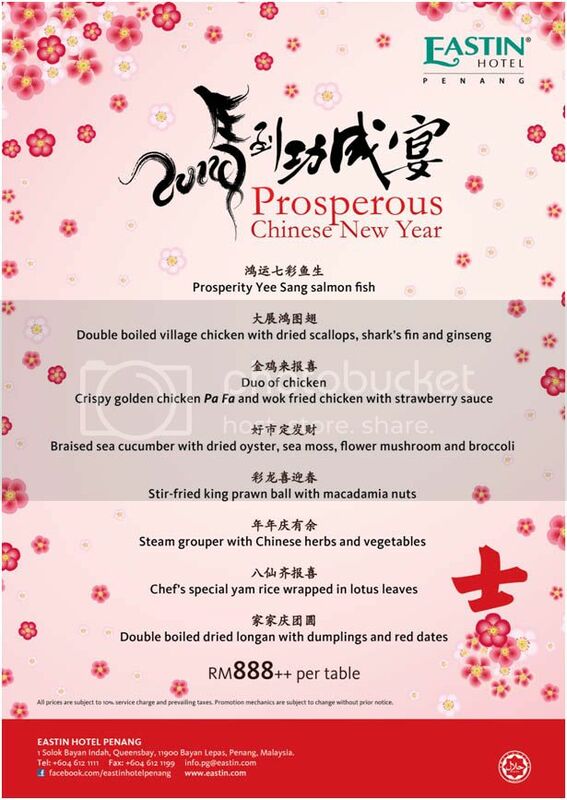 It’s one great dish that I would always look forward to each year at Eastin Hotel Penang. The spices and herbs used in slowly simmering the bull’s thigh bones combined with some potatoes and carrots were indeed “powerful”. 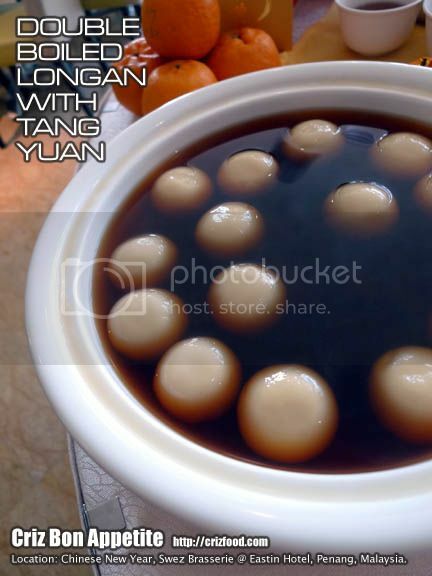 A bowl of this heavenly dish would surely keep the body energetic and rejuvenated for any activities during the fasting month. 9. 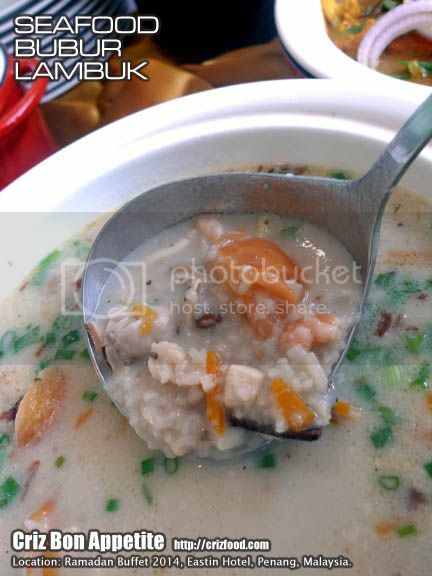 One of the popular Ramadan specialties would be an energy packed porridge known as Bubur Lambuk. 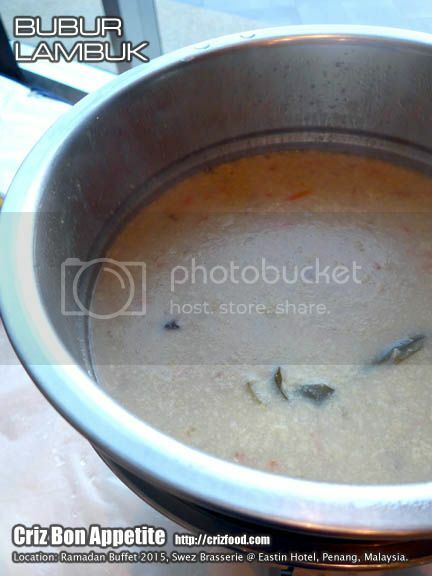 The porridge is normally prepared by volunteers in mosques throughout the country and served to the public for free. 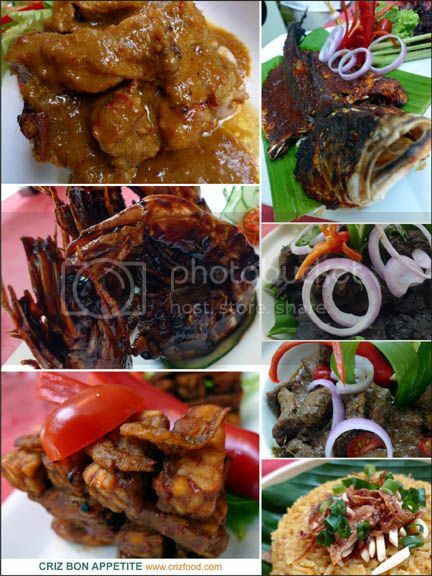 The ingredients used from state to state might be different, ranging from poultry, meat and seafood. 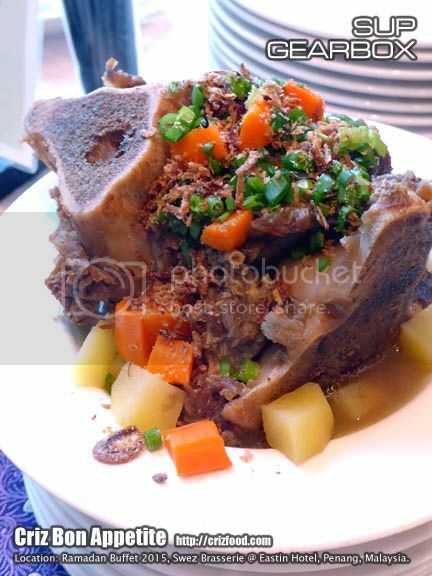 The most popular one would be the spice and energy packed porridge with the use of rich beef bone stock for that extra power. 10. 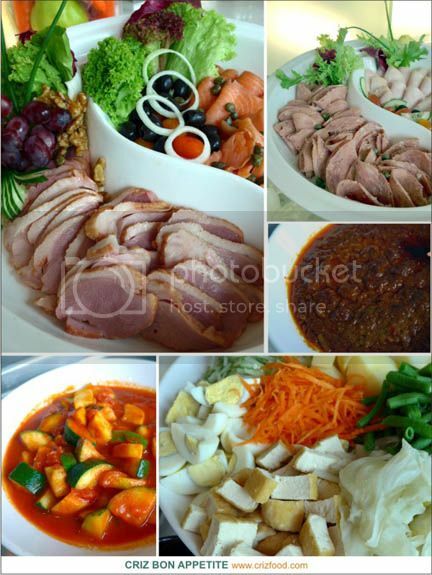 You should check out the Panggang Station for more flavorful grilled dishes. 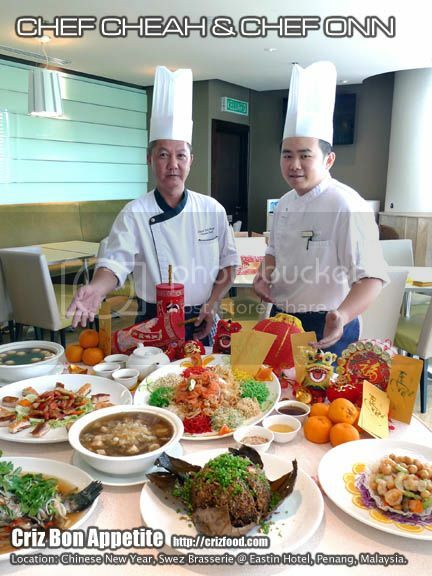 Depending on the stock available for the day, there will be at least 6 types of meat and seafood served daily during the fasting month. 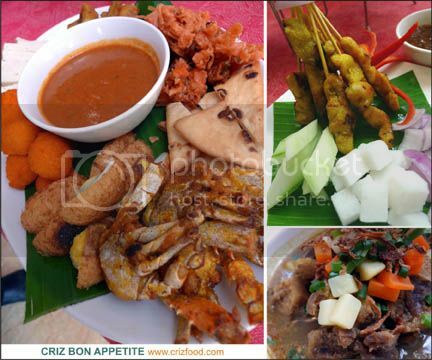 RM88nett/pax for the Ramadan Buffet Dinner from18th June to 18th July 2015. 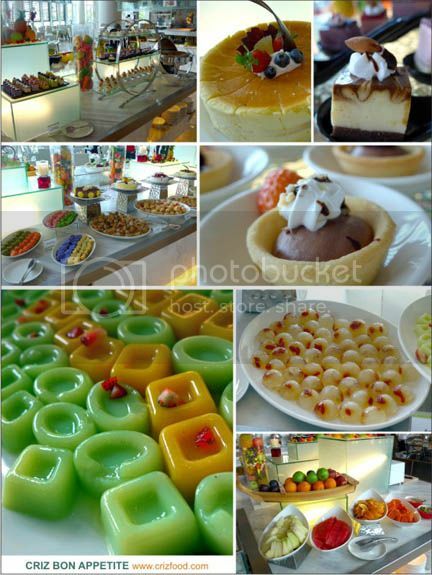 15% discount for members during the Ramadan Buffet Dinner. Note: Senior citizens will get 50% discount. 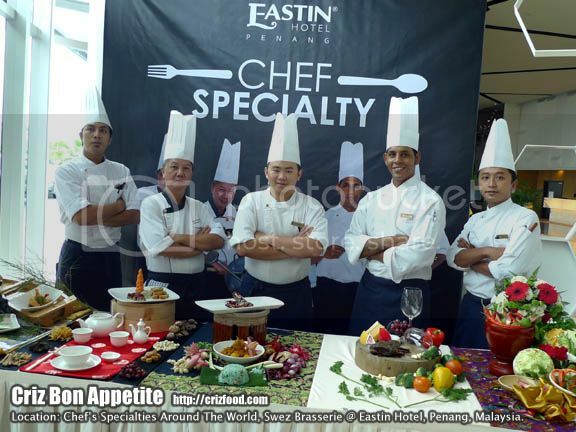 Swez Brasserie @ Eastin Hotel, Penang will be revamping its theme for the “Chef’s Specialties Around The World” promotion for November 2014 until January 2015 (1 November 2014 – 31 January 2015). 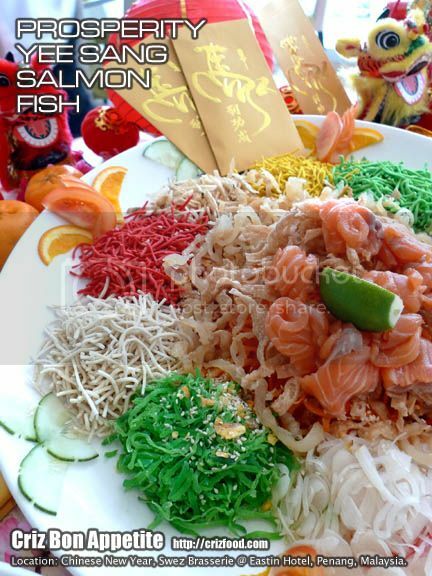 Diners will be treated with flavorful international cuisine during these 3 months, which will include Japanese Cuisine, Chinese Cuisine, Peranakan Cuisine, European Cuisine and Thai Cuisine by the skillful chefs. Check out the privileges for certain bank’s credit cards at their promotion website. 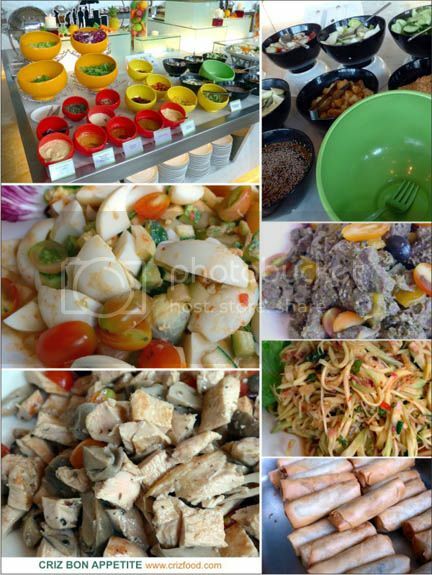 Now let’s have a look at some of the dishes they will be offering on the different days for lunch. 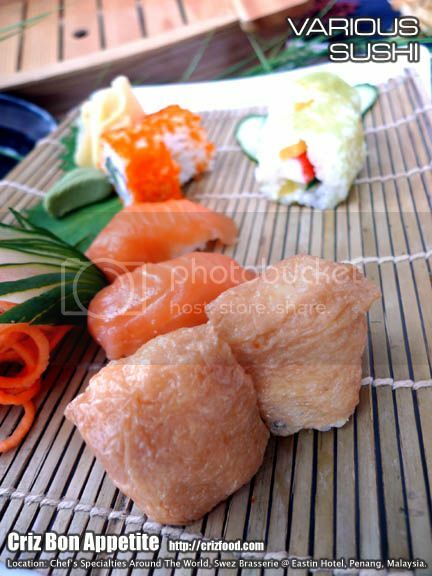 Mondays: Chef Nuhaini Abu Bakar with various Japanese Cuisine such as Sushi and Tempura. 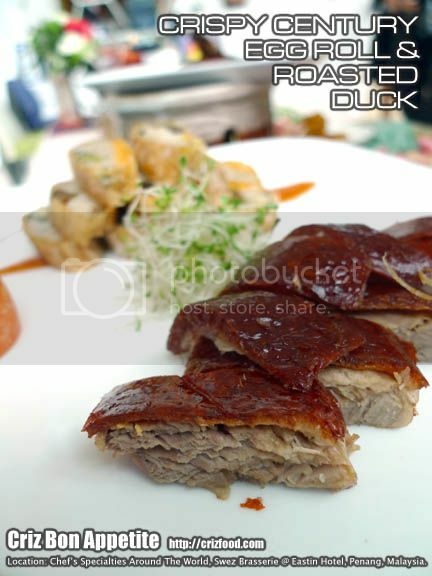 Tuesdays: Chef Cheah Teik Huat with various Chinese Cuisine such as Crispy Century Egg Roll and Roasted Duck. 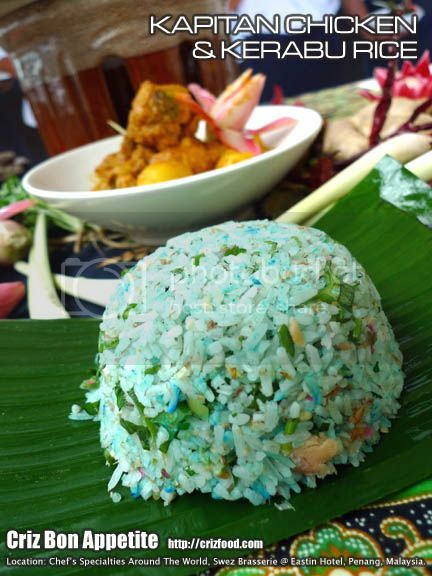 Wednesdays: Chef Chan Teik Onn will spice up various taste of the Peranakan Cuinese, a unique blend of Chinese, Malay and other influences, with dishes such as the Kapitan Chicken, Kerabu Rice and Assam Prawn. Thursdays: Chef Kevin Christie Menon will bring you the taste of European Cuisine with dishes such as Slow Braised Barbecue Beef Ribs. 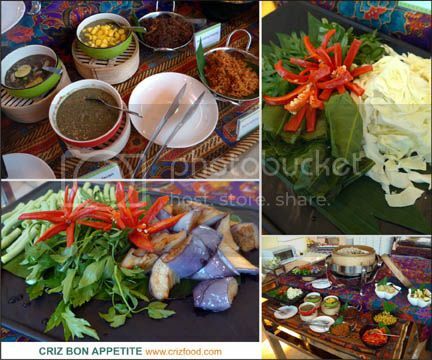 Fridays: Chef Khalil b Khazali will pep up various Thai Cuisine such as the popular Thai Green Curry Chicken. 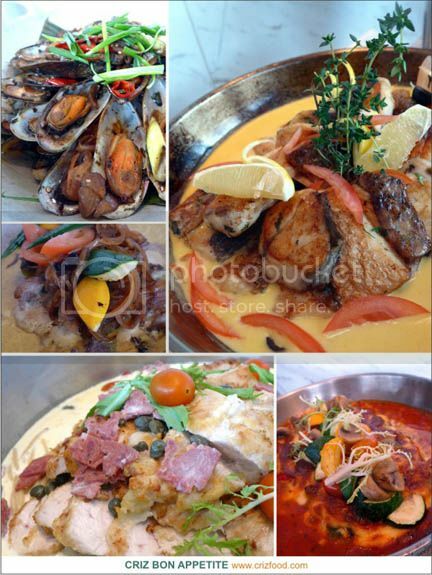 Overall, you will get to savor the dishes by 5 talented chefs weekly instead of monthly now. 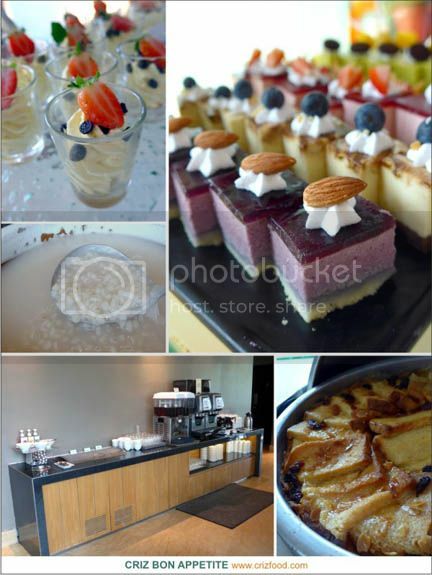 Each of them will pamper you with their specialties weekly until the promotion ends on January 2015. 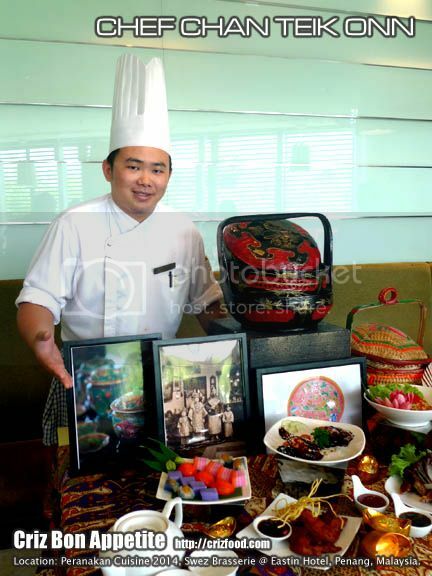 For the whole month of July 2014, Swez Brasserie @ Eastin Hotel, Penang, would be having its Peranakan Cuisine Promotion (1-31 July 2014). 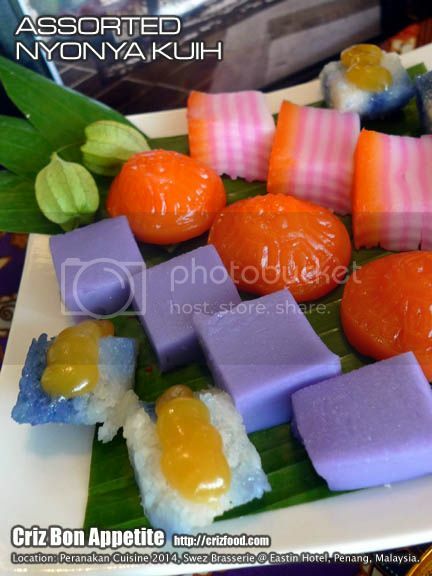 The Peranakan cuisine or more commonly known as the Nyonya cuisine, is a cuisine combination of Chinese (different origins), Malay and other influences such as Thai and Indian into a unique blend of its own. 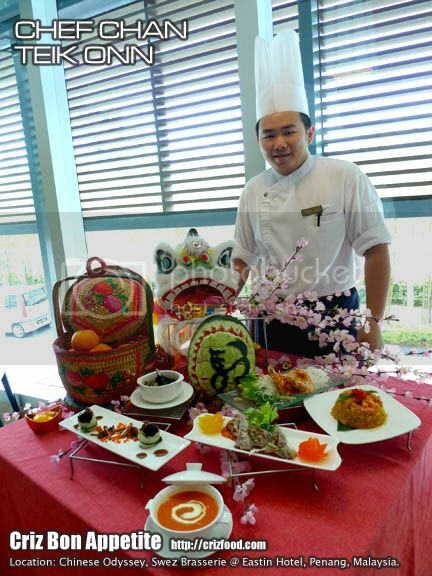 This promotion would be under the skillful hands of the Asian Kitchen Chef, Chef Chan Teik Onn. 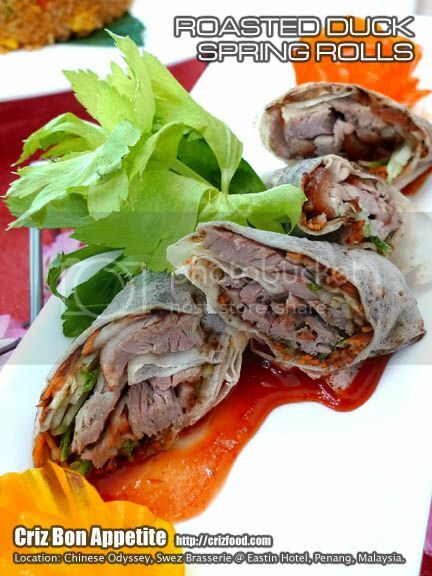 Firstly, you would get to savor the Deep Fried Chicken Lobak (炸鸡肉卷), a Nyonya favorite meat roll which consisted of marinated chicken slices in 5-spice powder and some added jicama rolled in dry bean curd sheet. 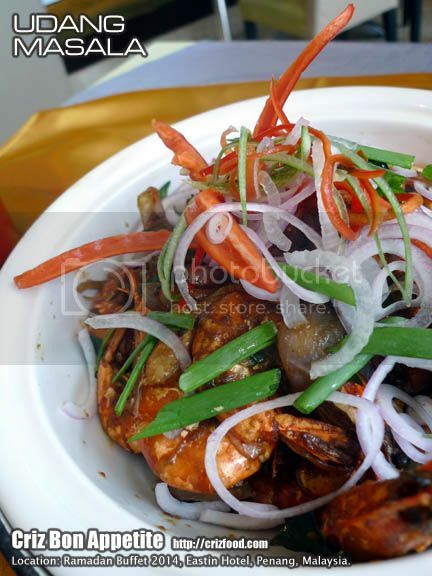 This is one common dish you would find at most economy rice stalls. 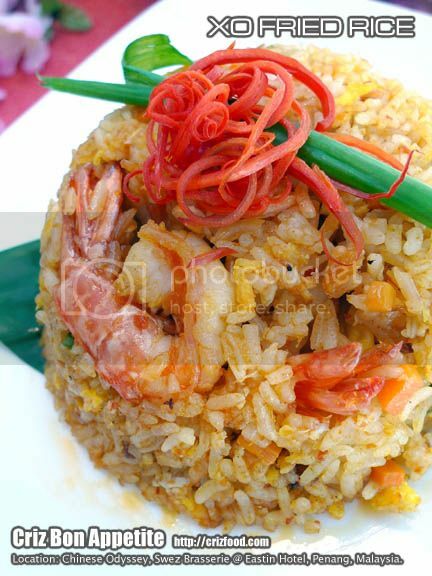 You would also get to savor the super time consuming dish known as the Nasi Ulam (野菜饭食). 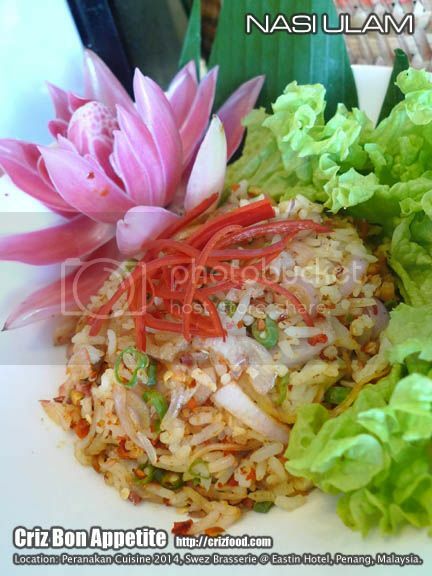 Sometimes also known as the Jungle Herbs Rice, this dish is definitely a very healthy diet as most of the ingredients are taken raw. 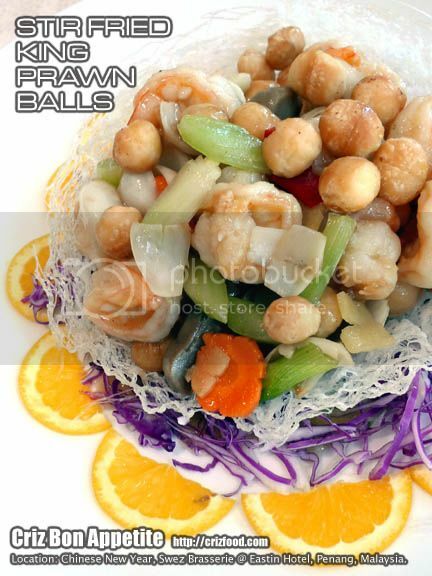 This is one of my favorite dishes with the fragrance coming from some added deep fried salted fish and dry shrimps. Though it’s one of the hardest dishes to make, you might want to check out the ingredients in my recipe. 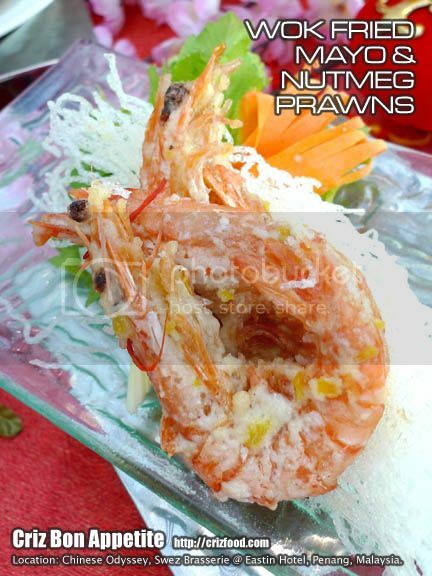 The next dish which was the Assam Prawns (亚参虾) had nicely marinated prawns with tamarind, a light touch of sugar and soy sauce. 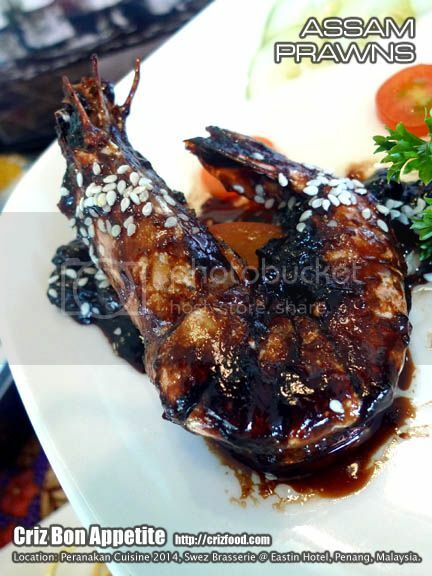 However, I still don’t like the idea of using tiger prawns instead of the ideal white/green shelled prawns as it won’t bring out the true flavors of this dish. 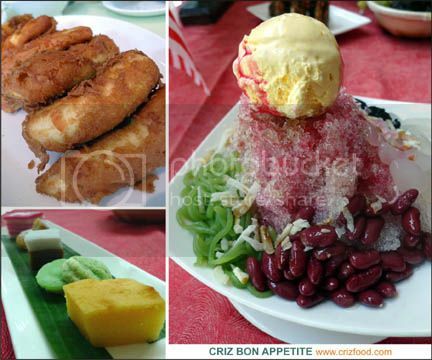 To all the kids, the next dish is everyone’s favorite – the Inchi Kabin (娘惹式炸鸡). 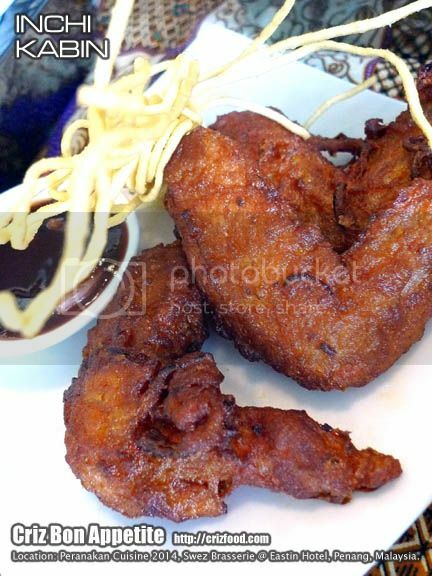 In a Nyonya family, everyone has their own secret recipe for this wonderful deep fried chicken. 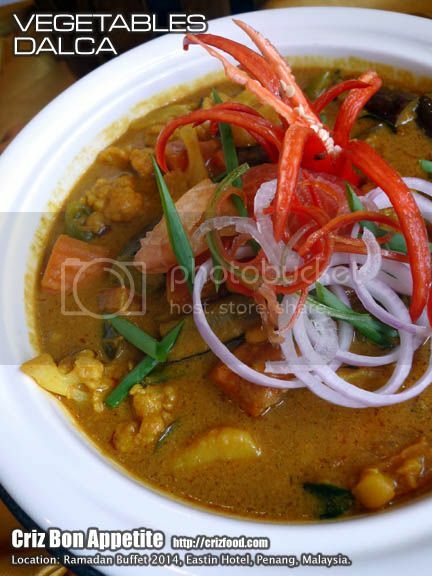 Some would add curry powder with some dashes of coconut milk. Some would just have them with turmeric powder with some added coriander powder. Some would have a bit of each spice which would include cinnamon, fennel, cloves, etc. 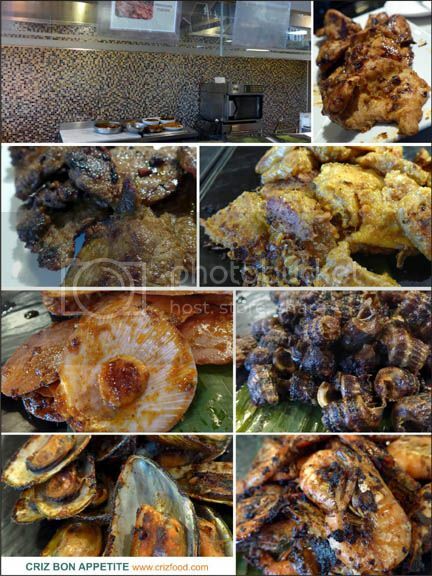 Overall, no matter how the chicken pieces (mostly chicken wings) were marinated, any piece of freshly fried chicken would surely boost up anyone’s appetite for more. 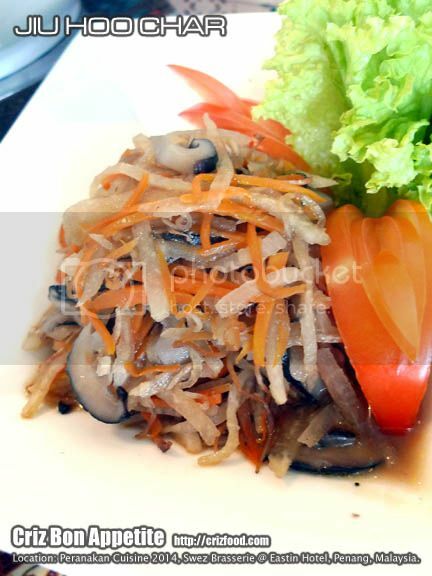 You would also have the Jiu Hoo Char (Stir Fried Shredded Dry Cuttlefish with Vegetables/鱿鱼炒蔬菜), a dish consisted of julienned jicama, carrots, Chinese mushroom and French beans stir fried with some dried cuttlefish. 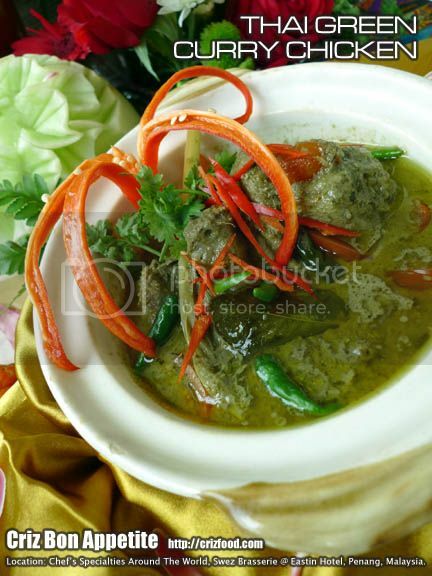 This is one of the signature dishes in Peranakan cuisine and best taken with some Chinese lettuce and sambal belacan. 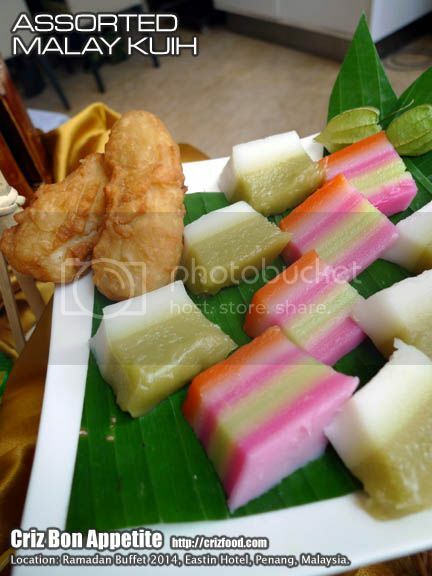 As for desserts, you would get to savor the Assorted Nyonya Kuih (各式娘惹糕点), which had some resemblances to the Malay kuih. 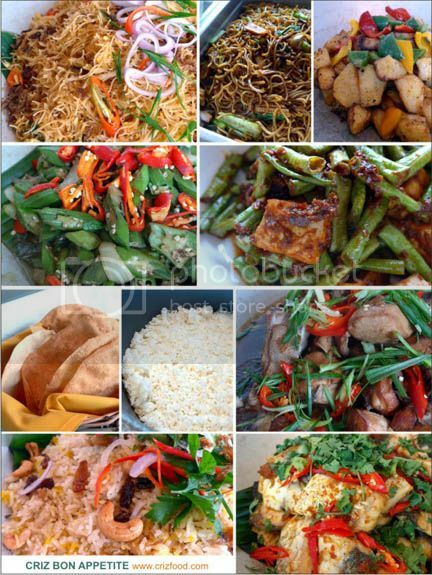 Overall, the cuisine served would be quite standard as you would get from the eateries out there. 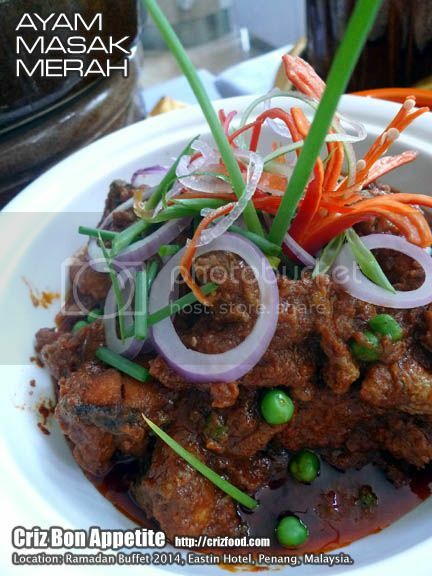 However, Peranakan/Nyonya cuisine can be rather time consuming in terms of preparation, so I guessed we might as well enjoy the chefs’ hard work in storming up those herbs and spiced infused dishes. 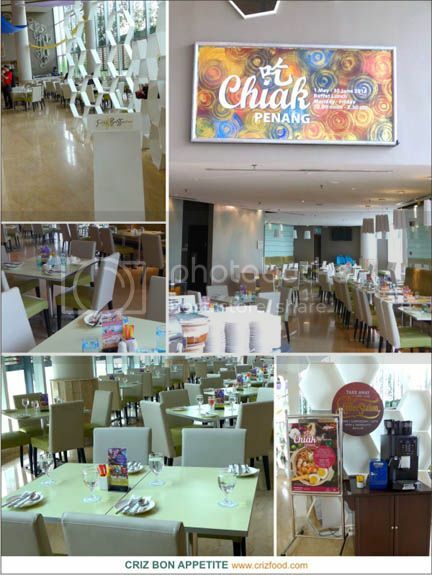 American Express, CIMB Bank, Citibank, OCBC Bank, Standard Chartered Bank, MasterCard Worldwide, Maybank and UOB Bank card members, guests can enjoy 15% discount for Semi Buffet Dinner (Monday – Thursday from 28-31 July 2014). Kali Orexi! Bon Appétit! 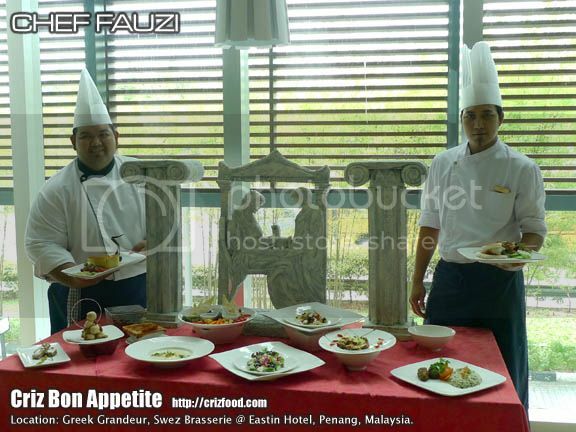 Welcome to the Greek Grandeur Promotion for May 2014 (1-31 May 2014) at Swez Brasserie @ Eastin Hotel, Penang. 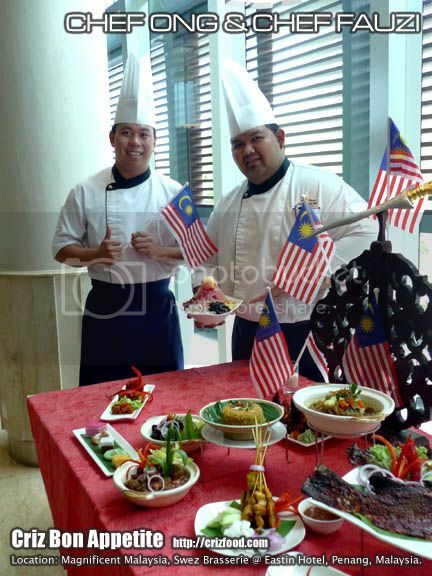 Jr. Sous Chef, Chef Mohamad Bakri with the help of his team members. The Greek cuisine has a history of thousands of years with the usage of fresh ingredients from the land and sea from the Mediterraneans. 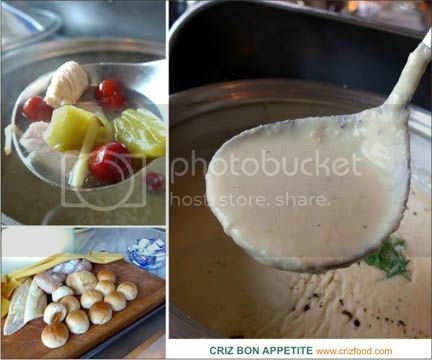 We started with some appetizers namely the Greek Mezze Platter (希腊小吃拼盘) which consists of assorted vegetables, risotto and minced lamb wraps, crispy tortilla and three type of dipping sauces, namely tuna yoghurt, cheesy dressing and Madras curry mayo. 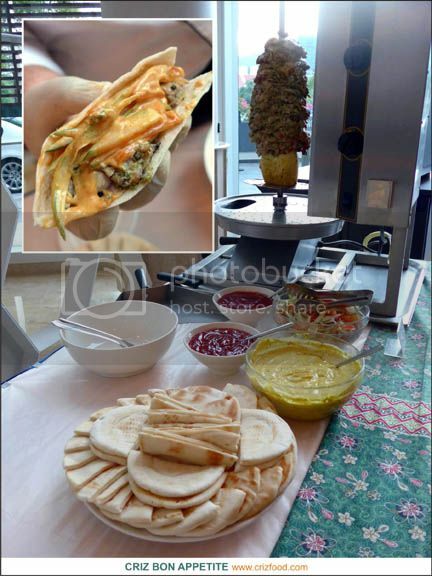 It was a total experience for many as we hardly had this type of almost similar middle-east appetizer. 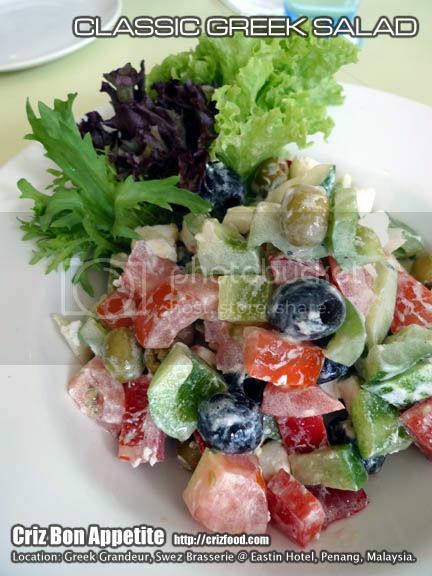 We also had the Classic Greek Salad (传统希腊沙拉), a basic salad with olives, capsicum, tomatoes zucchini and feta cheese dressed in olive oil, herbs and a light sprinkles of salt. It was simple but yet refreshing. 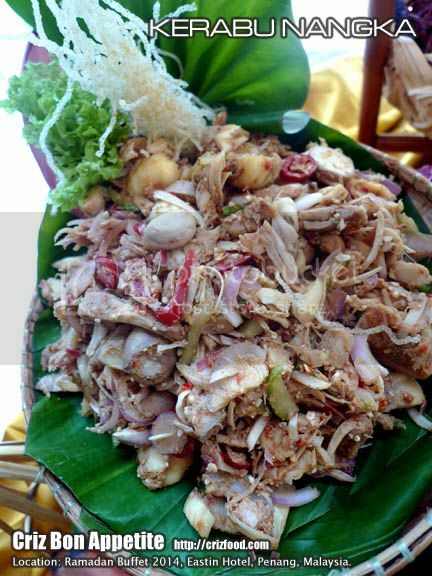 Sometimes, this dish is also known as Horiatiki Salata. 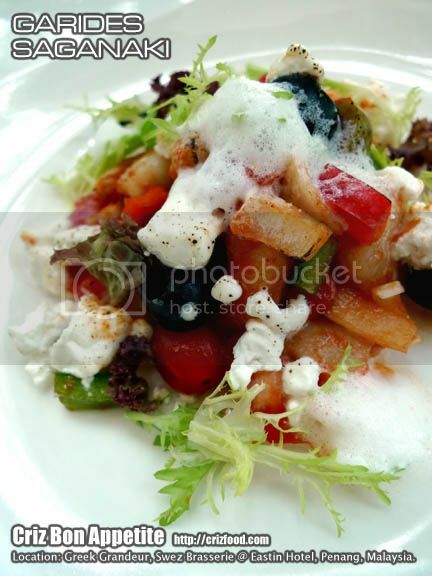 We were also served with the Garides Saganaki (虾仁与番茄羊乳酪), another variant of Greek salad with added shrimps and a heavier usage of tomatoes. However, it was a bit different compared to the ones I had taken as ripened tomatoes were used instead to give the dish a more puree tomato like sweetness. 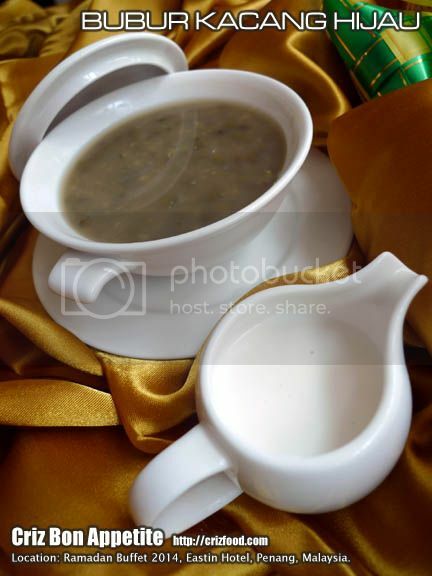 Next on the list was the Avgolemono (希腊鸡汤与蛋), a Greek Chicken Soup with Egg Lemon Sauce. 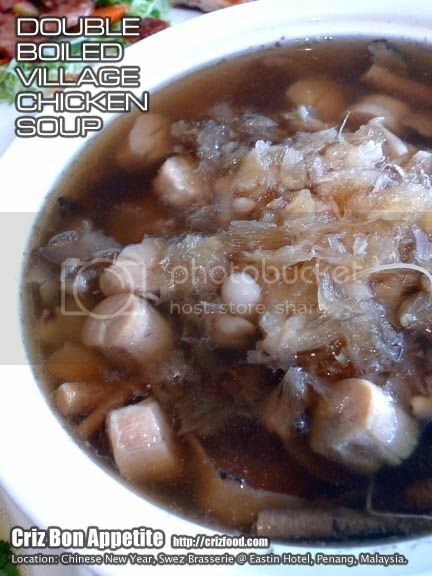 As for taste, it really has the flavors those Campbell’s canned chicken mushroom soup. 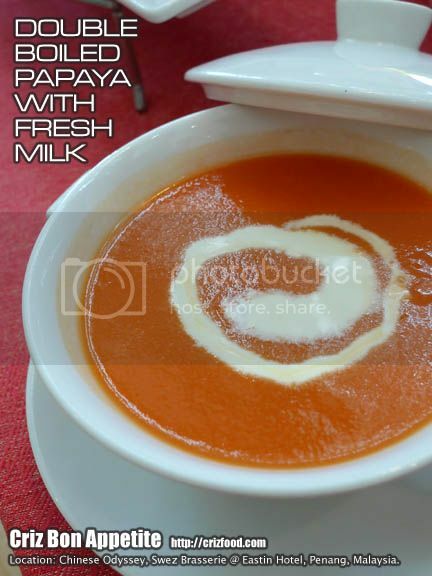 The soup somehow lacked the sweetness from the added vegetables and some fragrant from the usage of more bay leaves. By right there should be some risotto like rice texture in the soup but they could have been blended and mixed into the soup. 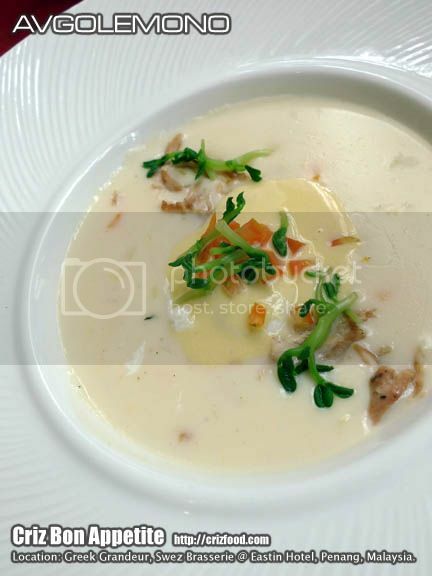 Though it’s just a simple soup to cook, some adjustments are needed to perfect this soup. 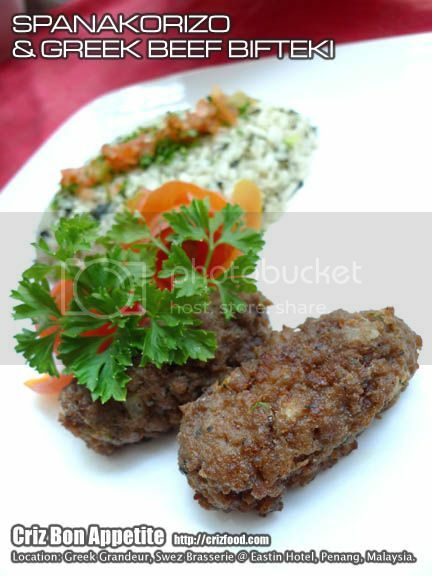 Basically, the Greek Beef Bifteki (希腊铁板牛肉) tasted like the beef burger but a roll-up version. 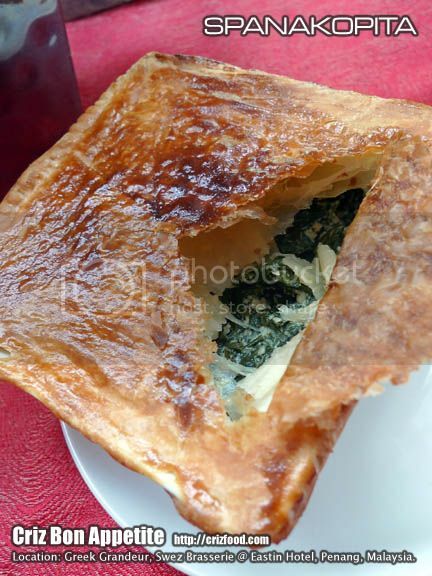 It had more herbs infused in it with a mild cheesy flavor from the added feta cheese. 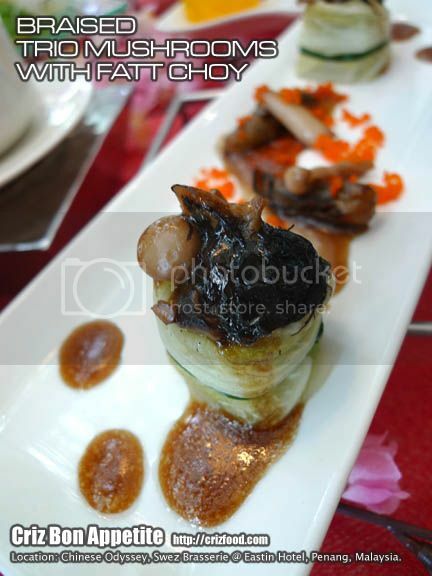 This dish was served together with the Spanakorizo. The Spanakorizo (Traditional Spinach and Rice/传统菠菜与米) on the other hand is a Greek vegetarian dish which has a Risotto creamy and al dente type of texture. 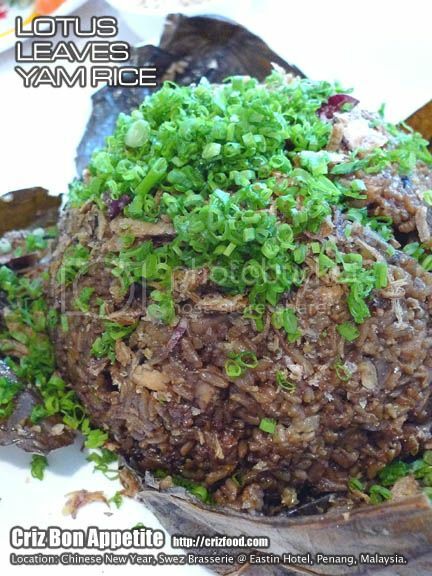 As for an Asian who’s so used to consume a softer texture of steamed rice, you may need some time to get use to this dish. 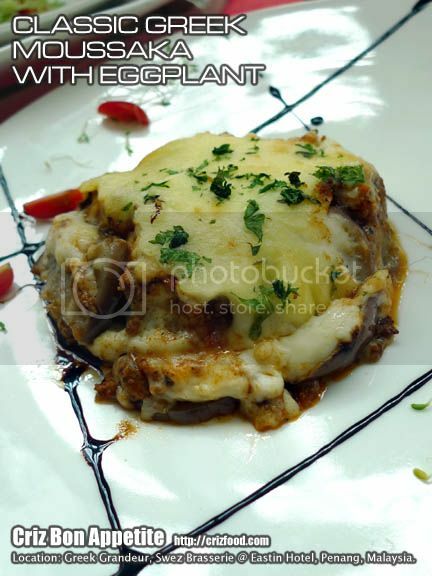 The main dish of Classic Greek Moussaka with Eggplant (希腊慕沙卡茄) is the Greek version of Lasagna-like dish with added eggplant. 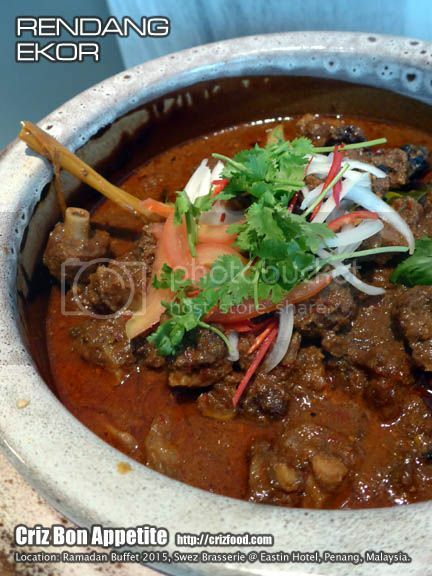 If you are a fan of lamb, you would surely like the strong flavors in the dish. Who said the Greeks never skew grill their dishes? 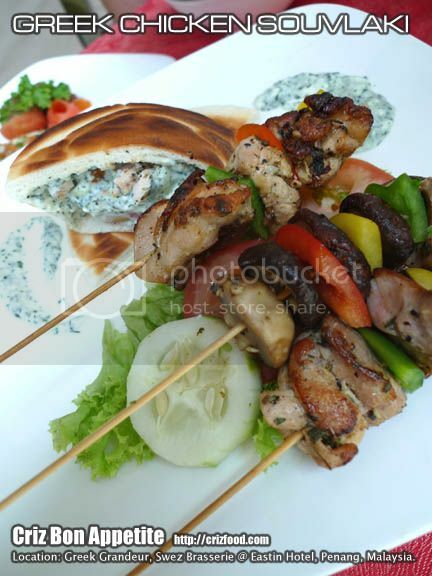 One lovely dish would be their Greek Chicken Souvlaki (希腊鸡肉蔬菜串). 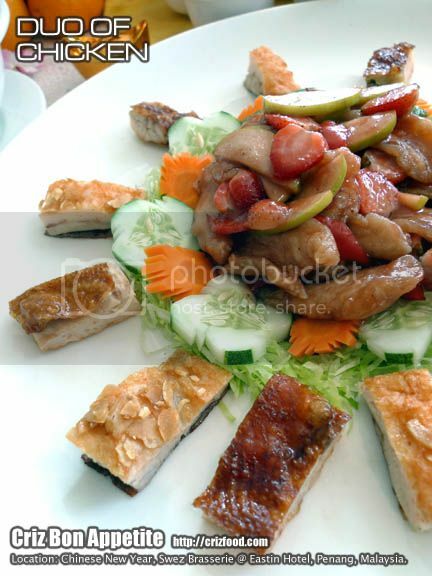 The skews had small chunks of well marinated chicken pieces and vegetables and grilled to perfection. These were served with a condiment of sour mint sauce. 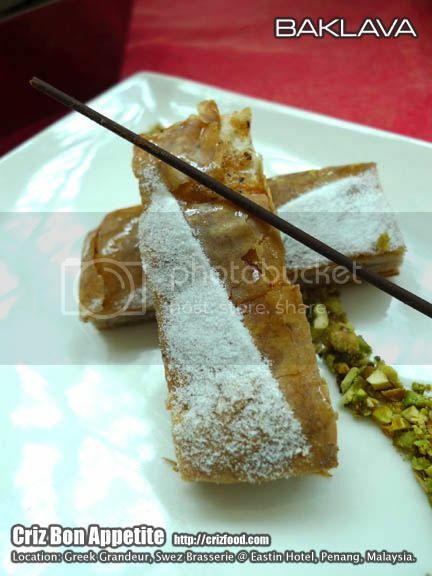 As for dessert, we were served with Baklava (果仁蜜饼), a nice flaky textured dessert made from layers of phyllo sheets and chopped nuts plus some honey. 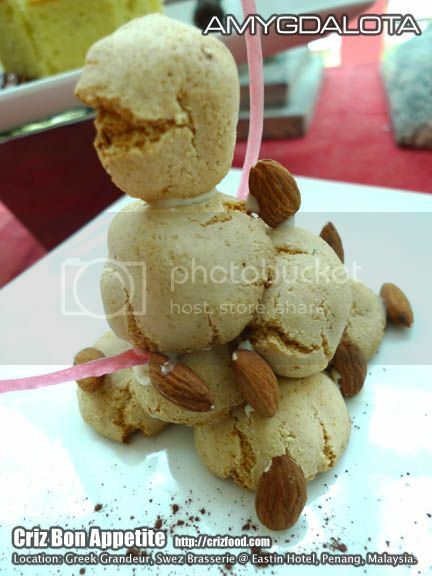 There was also the Amygdalota (Almond Cookies/杏仁曲奇). However, all of us found them to be of a harder texture which made biting a bit tough without dipping in a cup of hot beverage. The Galaktoboureko (Greek Custard Pie/希腊蛋奶饼) on the other hand tasted like a grainy and soaked up butter cake without the presence of added phyllo sheets for that crispiness. 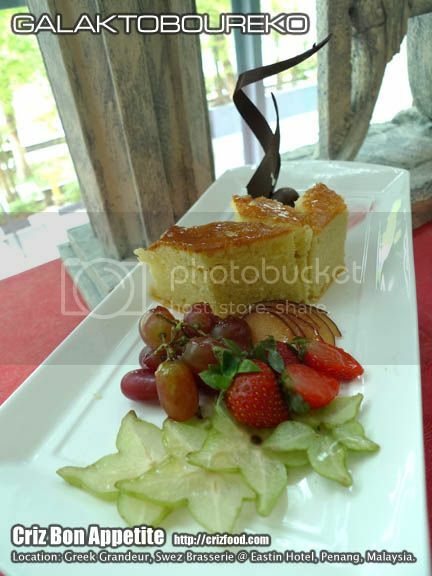 Though it was not the perfect dessert to my liking, it had a zesty flavor with a very light touch of added spices. 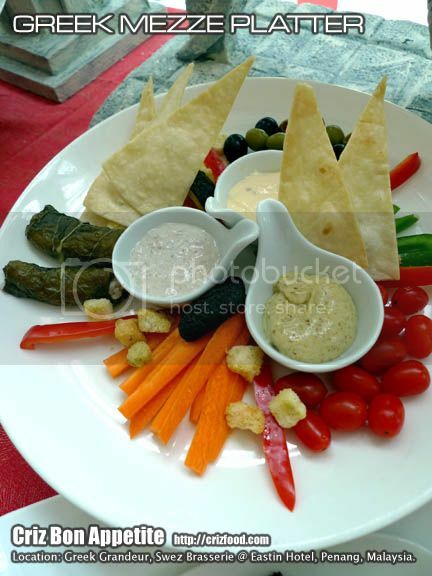 Overall, the dishes served in the Greek Grandeur Promotion 2014 would suit those cheese lovers more as Greek cuisine utilized quite a lot of cheeses, olives, olive oil, eggplant, zucchini, yoghurt, mixed herbs, etc. 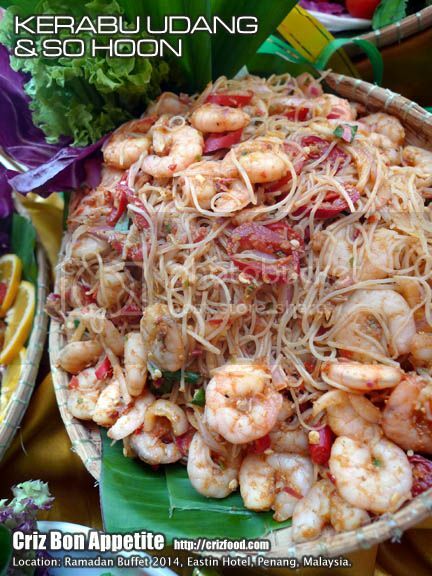 For American Express, CIMB Bank, OCBC Bank, Standard Chartered Bank, MasterCard Worldwide, Maybank and UOB Bank card members, you can enjoy 15% discount for the Semi Buffet Dinner (Sunday to Tuesday & Thursday) and Weekend Buffet Dinner (Saturday) from 6.30pm-10.00pm.